Architect Doug Garofalo is directly involved in the two main events happening in Chicago this year, co-designing two venues for the Chicago 2016 Olympic bid and being the local architect for the UNStudio designed pavilion to celebrate the Burnham Centennial. Iker Gil talked to him at his studio in Chicago about his involvement in both events, the opportunities, and the role of the design community. The cameras of Spirit of Space were there to document the event. IG: You have previously designed several public projects and temporary structures such as the Earth from Above exhibit at Millennium Park and the intervention in the front plaza of the Museum of Contemporary Art in Chicago in 2003. Currently, you are involved in two projects that deal with the notion of global and local events: the design of two Olympic venues for the Chicago 2016 bid and serving the local architect for the pavilion designed by UNStudio created to celebrate the Centennial of the Plan of Chicago. 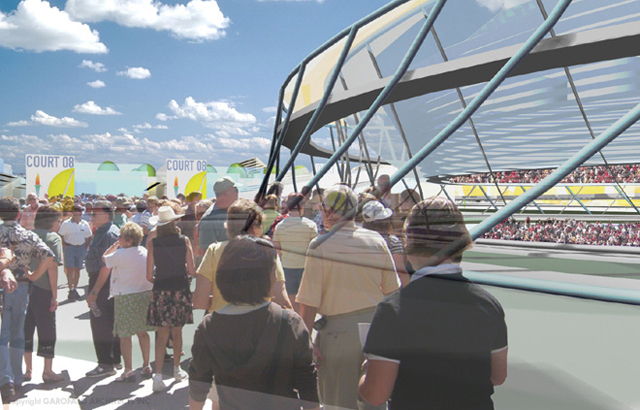 How do you approach a project for an event like the Olympic Games or the Burnham Centennial? DG: The Olympics, I mean, it’s public in the sense that it is international. So there is all this scrutiny that I think really changes it. In a certain way, I could answer and say that we look at all of our work as incredibly serious, not just the work being serious but that it affects public space to greater and lesser degrees. I mean, a residential project does too. But yeah, the Olympic venues become things that are under international scrutiny. The other thing about them is they change the city, a lot of it’s temporary depending on the venue. The one that is most permanent is the housing. So that’s taken into account, they are temporary structures. And the other thing that’s kind of strange I haven’t had experience with until then was how one designs for the press, actually. You start thinking about what it is going to look like on television. The other thing you find out right away is that there is pyramid: the athletes are at the top and you think it’s their family next, but it’s actually the press, and they are very explicit about this. The functioning of the venue, the way it works, the way the press is handled, the space they are given, all the stuff that doesn’t show at the Olympics is pretty serious. IG: Olympic venues have always exploited their potential through the TV images, as was evident in the recent Olympic Games in Beijing, where the Olympic stadium and National Aquatic Center became instantly recognizable structures. Except for the people that would attend the games, the rest, 4.7 billion in 2008, will experience the building through TV. Does that change how you think about the building? DG: It’s just going to be a flash. It does change how you look at it. Again, I will repeat that you always want to do great work, but it’s temporary structure, to greater or lesser degrees. We worked on the tennis venue with David Woodhouse and although the tennis stadium, as it were, was considered temporary, the lakefront park where there are courts now would be way upgraded, upgraded significantly, and those are obviously left behind, they are not going to be taken down. So, that’s the other thing about these, they are temporary but things are left behind. I don’t know the degrees for the other venues but the swimming pavilion we did with Studio Gang, that was considered something that would, to a greater or lesser degree, stay. And one of the sites we went to see and talked about was UIC and looking at the existing swimming facility on Roosevelt, I don’t know if you know it. Sort of building on top of that and extending it was one idea. I think it was a great idea that we talked about with Studio Gang. But in the end, I don’t think that’s the venue area location that will be built. DG: Yeah, but if I remember the video right, it’s just this fly through that quickly flies over a rectangle. This is not Beijing, right? Because the Aquatic Center was quite nice. IG: In the case of the two venues that you are designing, the Aquatic Center has had a great impact in the last Olympic Games, like the one in Beijing. DG: It’s also one of the ones that is on television the most. Between that, Gymnastics and then Track and Field, those are the three biggies if you will. During the last Olympics, I would have hoped that they would show some of the wrestling and I think they showed like half of one match with an American in it. It’s absurd, right? IG: They focus on specific sports but Aquatics seems to be a consistently big event. For London 2012, Zaha Hadid is the designer for that venue. It seems that Aquatics is in the first league of the venues. DG: I am curious whether certain countries decide what they are going to emphasize. This is probably true, that they decide what they are going to emphasize based on the chance of their athletes winning. I think that it’s gotta be true in the case of the United States, maybe in other countries it’s more of a wide range of what they show. It seems to me that it’s been new structures, sites, etc. in some Olympics and not in others. I am not an expert on it, but certainly in Beijing.? IG: In Barcelona, one of the most remembered venues was the Archery venue, designed by Enric Miralles and Carme Pinós. IG: And it’s pretty amazing that the sport itself is not one of the most popular ones but the structure it’s fantastic. DG: It’s a beautiful pavilion. IG: Let’s talk more about the ideas behind the Olympic venues that you designed with David Woodhouse Architects and Studio Gang, the Tennis facilities and the Aquatic Center? DG: In terms of the tennis one, we actually started with David thinking about two things. One was the circulation, more so from the vantage point of the public. The other was how this even temporary object, the stadium itself, would be present. And we started to think about what it might look like from the lake, because there is only a certain amount of the public that get into these events. So we wanted to make sure that the exterior of this stadium was not only pleasing, but kind of provocative. So we started there as we got into it, you know, obviously it wasn’t just… the public is kind of lower down on that pyramid, right? It’s the access of the press and how the athletes are shuttled in and out that becomes important. I think we solved all that and I think the stadium, it’s a temporary stadium, was kind of a screen-like, not literally fabric, but screen-like skin on the outside of the structure was pretty interesting. All the architects who did the venues got them to the point of being imagery as opposed to engineering them. We thought we had a pretty good twisting structural idea. We talked about it in scaffolding so it could all be unbolted and taken apart. The Aquatic Center is different, a permanent building. We had a little back and forth with the committee and with the site, which was UIC, but you know, in UIC’s case they basically said: We don’t need that many swimming pools. IG: Because it ends up being 5 swimming pools. DG: Yeah, I think it was 4 or 5, I can’t remember. So it became this kind of negotiation or discussion about the need to keep all or some of the practice and competition pools, one of which also had a diving pool. These things don’t get decided at this point but we had some good ideas that ultimately because UIC was, honestly, kind of difficult, the committee just started looking elsewhere and there was not enough time for us to make a new proposal. Again, the Aquatic Center is a really, really interesting venue, and I’m not sure how it will happen. I don’t know if you know this, but all that venue planning was just for Chicago to win the US bid. After we did all that work, there was a meeting of everybody involved, and congratulations and then, particularly us designers were told: “Well there is no more design at this point. We are putting together the package to get the Olympics internationally now to be chosen.” And we were kind of shocked, it’s Chicago after all. How can you expect to win the Olympics in a city like Chicago and not deal with design in a, I’ll say, more aggressive way? If I am not mistaken, I think that Japan’s efforts, I want to say Tadao Ando did everything, whereas these venues I think there was a dozen architecture firms or something like that. IG: I was involved in the first nine months of the domestic bid and it was really interesting to understand the goals. There is a completely different approach between the different bids. Madrid is currently building some of the venues, for example, the Tennis facilities designed by Dominique Perrault that opened last week. Instead of saying these are just ideas and if we get the Olympics, we can begin the design; Madrid is actually building the venues already. DG: I had hoped that with Chicago going for the Olympics, one outcome would be a real emphasis or scrutiny of public transportation. And it never happened. In fact, I believe the committee application, the part after Chicago got it, I think it took them a year or a year and a half to put it together, I believe they, if I am not mistaken and I could be mistaken, they called Chicago’s proposal compact, which in comparison to what I don’t know, and that everything was easily accessible. The athletes, the press… that’s not public transportation, that’s very guarded. I don’t know about the athletes’ families, probably then too. But the public, I don’t think it’s an issue in a certain regard because in relationship to how many people watch it in this country and around the world, the amount of people actually going to an event is really small. It’s very interesting, the things you learn. 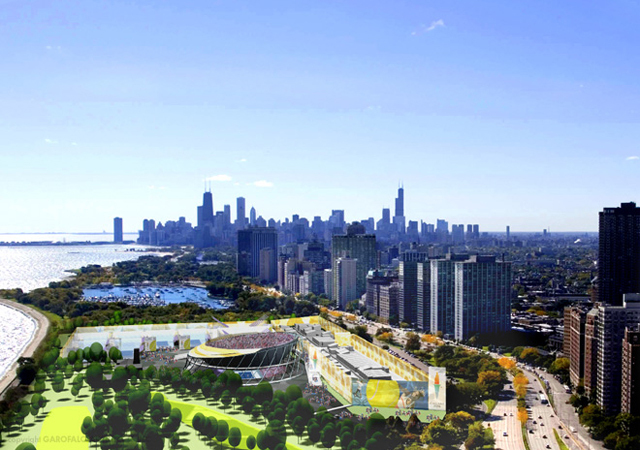 IG: As you mentioned earlier, several architecture offices from Chicago were selected to design venues for the Chicago 2016 Olympic bid. I am curious to know, even that the designs were independent from each other, if there was any discussion among each other about the design goals of the Olympic bid? In a way, was there a message or an attitude that the Chicago architecture community wanted to send? DG: There was none of that. We had a few meetings, they were more about the format things had to be put in to be submitted to the US Committee. But there was no, what I would translate your question as, there was no sense about, say, an urban design idea / set of concepts to my way of thinking. We compose some meetings, they were pretty rudimentary, and then we go off and design on our own. You know, we would meet with appropriate people relative to the sites, like we meet with the UIC people for the Aquatics Center. We didn’t meet with anybody relative to the tennis venue, you know, no Chicago Park District people. Part of that is ‘cause these things were not literally getting designed. It was a matter of making then work as diagrams and then producing some renderings. But yeah, a little bit disappointing to not talk about it as an opportunity for the city. IG: I think there could be a parallel agenda that if it’s not generated by the Olympic process, there could be something that comes from the design community. DG: That’s exactly what should happen. You know, were we to get the Olympics, hopefully all, maybe just some other architects [should get involved], I don’t know. The first thing that should happen, and it should happen frequently, it’s this sitting down and talking about the larger picture instead of planning venues one by one. I can imagine that. The idea would then be this kind of collage or idea of heterogeneity that every venue is radically different but together there is a concept to go after purposefully. I mean, that’s an idea but without stating it and discussing it, it’s not going to happen. IG: In that sense, I think the architecture community has to take the blame, we have to generate that discussion if it’s not coming to us. Maybe grabbing the idea of Olympics is something that can get everyone closer. DG: You know, nothing like this has happened. I agree it’s an opportunity, it’s an opportunity for any city. It’s a big opportunity because I think these days, very few cities think about, or even less, implement, large scale changes. Chicago is a little bit unique. The whole landscape issues that Mayor Daley dealt with the last ten years have really changed the city. But architecturally, tectonically, projects are individual things dotting the landscape. The Olympics is a chance to, maybe not do something continuous but create a series of what could be landmarks. The stadium as I understand it, was going to stay in place in the park but the real big opportunity is the housing. The athletes’ housing for this Olympics and the Paralympics that come afterwards and then what happens to it. The site chosen, actually the site subsequently talked about, the Michael Reese site, is valuable, it’s on the lake so the idea that some of this could turn into affordable or low income housing, I have my doubts. A few of us who did do some venues have been getting together on our own time designing that site but, you know, we’ve tried to get it in front of the committee and you know, again, design doesn’t seem to be important. There is a still a hope maybe if we get the Olympics. Maybe we can have an exhibit or something. IG: In Barcelona not only did it change the city but it also created a generation of architects. Through that event, a whole generation of architects received their first commissions and moved forward. Can that be something that happens here? Through the event, can you raise the level of interest of students so they get involved in architecture and design schools, the younger practices can actually begin to build, and the more established practices can guide the younger generations? DG: You are an optimist, which I love, and I want what you just described to happen, you know, opportunities for students, younger practitioners… I thought what you were going to say about the more established ones that they do their best work. It’s not that I am cynical. I want exactly all those things to happen. How they happen I think, maybe you indicated this, but I think that the architecture community in some fashion might have to form or agree or create something before hand. And it hasn’t happened in this or any other city in a long, long time. You know, it’s the Centennial here of the Burnham Plan and it wasn’t like that was an organization of people. I mean, it affected the city in a great way but it was Daniel Burnham in his office of how many people? I don’t know, 2, 6, 10? I am not sure. And you know, in the end not too much of it implemented. But I think the right kind of things implemented. IG: What is interesting is that the Plan was done for the business community. DG: It’s not purely architectural. IG: It is making the city better so you develop it economically. DG: You know, in a way, I think it was a phenomenal thing that happened in the city. But, I don’t know if you know, there was this thing called the Wacker Manual that came some years later, which is essentially a school book for children. If you actually read it though, as an adult or as a grown up kid, I am not sure which, it’s pretty fascinating. And Moody, it was done by Walter Moody, I don’t think he was any friend of Burnham, but throughout this thing are illustrations that Burnham did and it talks about the city and what it is, what cities have been historically, how they are thought about, you know, how they operate, etc. It’s a really interesting publication. Again, done by just a few people. I really wished it was still used in the public school system, that’s what it was made for. But I imagine that something like that, well not exactly like that ‘cause there is no agreed upon plan in place, but maybe a kind of a publication of projects, thoughts by a group of architects could be compiled. But it would have to happen fast, actually. IG: I think there is a lot of energy that if it’s coordinated, it will ultimately benefit the individual offices. It benefits the public discussion, the public debate about the city and then ultimately, the design offices. DG: I think you are right. One would hope there would be a public discussion. I think one of the keys would be to have that public discussion, no matter who the sponsor is, somehow be tied or at least affect the mechanisms, decision-making of the city. Not an easy thing in this city, not something that has happened a lot. I give the Mayor all the credit for what he’s done in 10-15 years, it has really changed the look and the feel of the city. But you know, it seems to me many more of the cities most talented architects could be involved in some kind of program that makes buildings and landscapes on a regular basis. IG: You are the local architect for the UNStudio pavilion for the Burnham Centennial. Despite that the Burnham Centennial does not have the global impact of the Olympic Games, it is definitely an important event this year in Chicago. After all, the 100 year old Plan of Chicago still guides the development of Chicago. DG: Yes, I think that’s a legitimate opinion. IG: It’s a guiding tool. DG: My opinion of it is that whenever we’ve done some work for the city like in Millennium Park, I’ve realized that there is no other plan, masterplan or set of principles than that. I’m not saying that they are referred to literally but it’s very clear that the project is the project, it’s not thought of in a bigger way. So yeah, it’s an important event. IG: How does the pavilion fit into the big picture? DG: Well, I guess what I was going to say before that is that I think the Burnham plan is just so out of date and there needs to be something more contemporary done. But in terms of UNStudio’s design, we weren’t really involved in the design, we are trying to execute it relative to craftsmanship and that kind of thing. It has to do with the grid but the form is derived from a kind of a torque and a twist of the grid. No one is going to see that, no one is going to understand that by walking up to this pavilion. But the pavilion creates specific views of the city, it kind of directs one’s attention and puts it in places maybe that one isn’t used to. And by that I mean you walk up on top of the platform, rectangular, and there is a rectangular roof above, but then there are these three eyebrows that come down and three eyebrows that go above, so when you approach one of those, your eye will go up this curvilinear shapes and these will frame views of the city. IG: More than experiencing the pavilion, the pavilion helps people to experience the city. DG: That’s one of its concepts, that it reframes the city. But it’s also very tectonic, very sculptural, very formal, very difficult to build… But there is also a lighting design by somebody else at UIC, Daniel Sauter, as well as Tracey Dear who does the lighting locally for the bridges, and they are great. 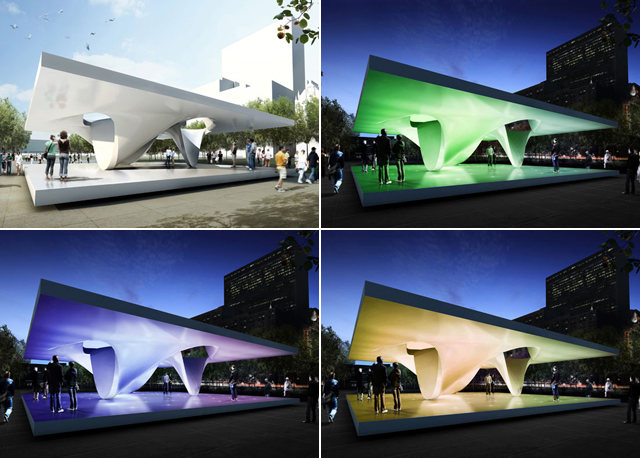 They’ve developed with UN studio a kind of a grid system in the platform that shoots color lights up to the underside of the canopy, and those are going to have sensors so when people walk around it’s going to slightly alter the color. So I think that’s going to be interesting. Again, relatively speaking, abstract. People won’t make a literal connection to the Burnham Plan. But I think it’s good that both pavilions, the other one by Hadid, they are architectural things. They are not landscapes per se and in that sense, you could argue that if not literal, they are interpretations. Lighting design concept for the Burnham Pavilion. IG: After the celebration of the Burnham Centennial, what is going to happen to the pavilion? DG: Completely different between the two. In the case of UNStudio’s, it will be mostly destroyed. We’re trying to figure it out and we will get it done. The steel of course will be recycled and the lighting, but after that, plywood and this coating it will be cut up, it’s not reusable. IG: Could it be moved to any park that needs a small facility? DG: You know, technically speaking it probably could be but I have my doubts about the finishes lasting more than the 6 or so months that it’s going to be up. IG: I recently came across the work of Niklas Goldbach. In his 2006 film Gan Eden, he shows two men moving through the pavilion of the Netherlands designed by MVRDV for the Expo 2000 in Hannover, Germany. The pavilion, a significant architectural building, was abandoned after the Expo and has fallen in disrepair. Niklas refers to it as a “contemporary ruin”. How could this issue, that also seems to happen quite often in the Olympic Games, be addressed? DG: I think Barcelona, when I went there for the first time two years ago, I was amazed that how much the Olympic venues were now part of the city, all along the waterfront in particular. Granted, Xavier Vendrell, who designed a few things, took us around but I was amazed at how the city took it as an opportunity to improve itself in an amazing way. That would be something to shoot for here. After Beijing I have to say so much money was spent on designers, more so than on any kind of landscape but the stadium and the Aquatic Center in particular, those are the venues that got shown. But keep in mind mostly the interiors, by a long shot the interiors. Beijing I think did a great thing, I don’t know what’s going to happen to that stadium, I keep hearing things. And I think in Chicago’s case it’s maybe going a bit in the opposite direction. These things, almost all, except the housing and to a lesser degree the stadium, are considered temporary. So it might be a real missed opportunity relative to us getting the Olympics or not. I don’t mean to sound cynical, it is a great opportunity. I just don’t know the mechanism by where there could be a kind of a manifesto put out there and got in front of the Mayor honestly as much as the committee and, you know, be convincing about what an opportunity it is. IG: The Olympics are always a great opportunity. If you play your cards well, it can have a lasting effect and if don’t, you will also have an important effect but probably in a short period of time. DG: On the upside, maybe it is just the event for the however many weeks it is. There is all this press and scrutiny and interest in Chicago and then maybe everything goes away. To a certain degree, one can argue that from a, I don’t know, an environmental stance, why should these things stay, particularly if they are not going to be used or they are going to become a set of ruins? I mean, the Burnham pavilions in the park were always meant to be temporary. They are designed specifically for an event and not to stay. Maybe that’s a lost opportunity too. Each of the pavilions could have been put in the park and designed to be permanent, although the budgets for them are slim. IG: While working on these projects, have you rediscovered any proposal for a pavilion or venue that really interested you and you had forgotten or were not aware of? DG: I haven’t come across one or remember one that’s anything like what we are doing. But I do think of certain individuals like Tatlin and a kind of temporary and permanent structures that were laced with politics and rhetoric, which I really like. They weren’t just interesting tectonically savvy things that he designed, they were connected to political movements. In a way, I keep thinking about, say, that’s one example of a pavilion. In terms of other Olympics, off the top of my head, there is not too much memorable with the exception of Barcelona again, but that’s in part ‘cause I recently went there. You are right, the Archery range and those buildings are fantastic. To me they still function as sculpture, if no other way. But Tatlin is the person that I keep thinking about. IG: A lot of people reference the Barcelona pavilion for the 1929 Expo designed by Mies van der Rohe. DG: I don’t think I can answer that. I’ve never liked picking one thing or favorites. It’s hard. I might be saying that I don’t know my history. Looking across the landscape and trying to think of my favorite pavilion or the one that I think last… it just doesn’t pop into my head nor do I like doing that sort of judging. MAS=EVENTS DOUG GAROFALO INTERVIEW from Spirit of Space on Vimeo. Doug Garofalo is an architect, partner at Garofalo Architects Inc and professor at the University of Illinois at Chicago (UIC). In 2006, his firm was the subject of a retrospective exhibit at the Art Institute of Chicago. He has been the recipient of numerous awards, including his 2008 selection as a United States Artists Target Fellow.